The old Phoenician port city of Sidon is located south of Beirut. Today known for its atmospheric souks, its most notable historic monument is the 13th century Crusader castle, located on a small island just off the coast, connected to the mainland by a causeway. Kerak and Shobak are two of numerous castles built by Crusader forces in the Middle East between the 11th and 13th centuries. Kerak is built on a hilltop overlooking the town, an imposing setting offering spectacular views, and very well preserved. Further south, Shobak Castle is less well preserved but equally impressive. Krak des Chevaliers (Fortress of the Knights or Qalat al-Hosn) is the most outstanding example of a Crusader castle in the Middle East. 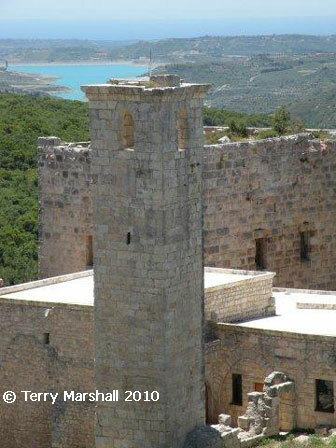 Located in a dramatic setting atop the Jebel Khalil ridge 700 metres above sea level, the castle dominates the surrounding landscape and guards the Homs valley. Constructed in the 12th century, the almost impregnable fortress was held by the Crusaders until it fell to a Mameluke siege in 1271. The castle is in an excellent state of repair and is worthy of extensive exploration around the Great Hall, chapel, through the long dark passages and along the ramparts. Qalat Saladin (or Fortress of Saladin) was a 10th century Byzantine construction that was captured and fortified by the Crusaders in the early 12th century. Captured by Saladin in 1188, it was subsequently modified by the Ayyubids. 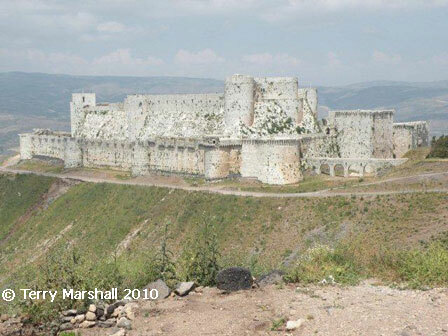 The fortress is dramatically located on a narrow ridge overlooking the route between Aleppo and Lattakia and although partly in ruins, provides another excellent example of medieval castles.